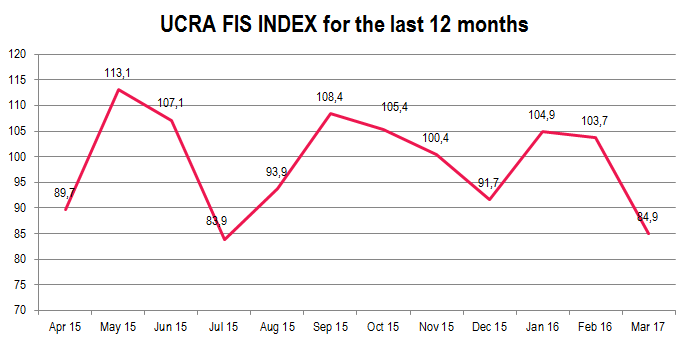 UCRA FIS INDEX (Foreign Investor Sentiment Index) for Ukraine fell sharply over the past month (by 18.8 points) and dropped into the negative zone, stopping at 84.9 points. The fall of the index reflects a sharp change in investor sentiment associated with the growth of political instability, increased risks of the government’s resignation and early elections, corruption scandals and conflicts within the government. These factors, in turn, affect the prospects of the IMF Extended Fund Facility program for Ukraine. Possible delays in getting the next tranches of the Fund’s financing provoke devaluation expectations of investors. 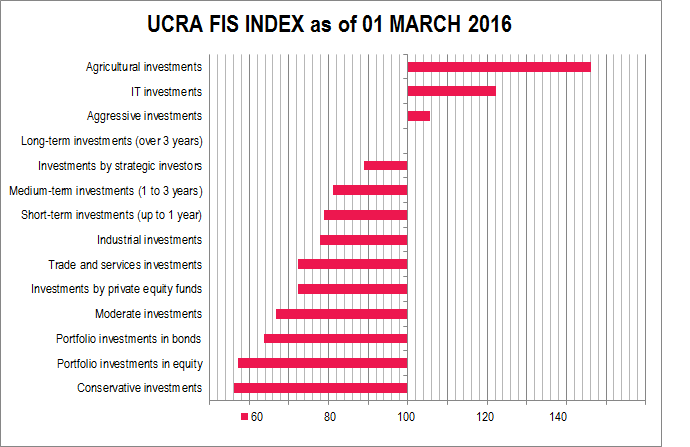 In the previous two months UCRA FIS INDEX was in the positive zone with the values of 103.7 on February 1 and 104.9 on January 1. In the sectoral side, as before, the most optimistic are the prospects of investment in agriculture (sub-index value of 146.3) – this is the only component of the composite index which never fell into the negative zone for the entire observation period (from January 2015 ). Despite a significant decline (by 23.9 points), assessment of the prospects of investment in the sphere of IT is still in the positive zone (sub-index value of 122.2 points). According to respondents, there’s a significant reduction of the attractiveness of investment in the trade and services sector (fell from 107.7 to 72.2), as well as in industry (fell from 100.0 to 77.8). Weak economic prospects of Ukrainian issuers of securities and foreign exchange restrictions on the market cause negative assessment of such instruments as equity investments (down from 60.5 to 57.1) and bonds (down from 97.5 to 63.8). The prospects of direct strategic investments are perceived by our respondents as rather weak (88.9), which is only slightly better than expectations from investments by private equity funds (72.2). Long-term investment attractiveness is at a neutral level (100.0), while the shortterm and medium-term investments attractiveness (79.0 and 81.3, respectively) is viewed negatively. Aggressive investment strategy (105.6), as has been the case over the entire period of observation, takes over moderate (66.7) and conservative (56.3) approaches to financing projects in Ukraine. UCRA FIS INDEX (Foreign Investor Sentiment Index) for Ukraine is a joint project of Ukrainian Credit Rating Agency and TRDATA UKRAINE. The index is calculated on monthly basis through a survey of the leading investment and consulting companies that assist in channeling foreign investments to Ukraine in order to assess the willingness of foreign investors to provide funding for Ukrainian companies during the next month. The resulting survey data is compared with the changes of the key market indicators for the previous month. The index calculation was carried out in the test mode since the beginning of 2015. Publication of the index commenced October 1, 2015.